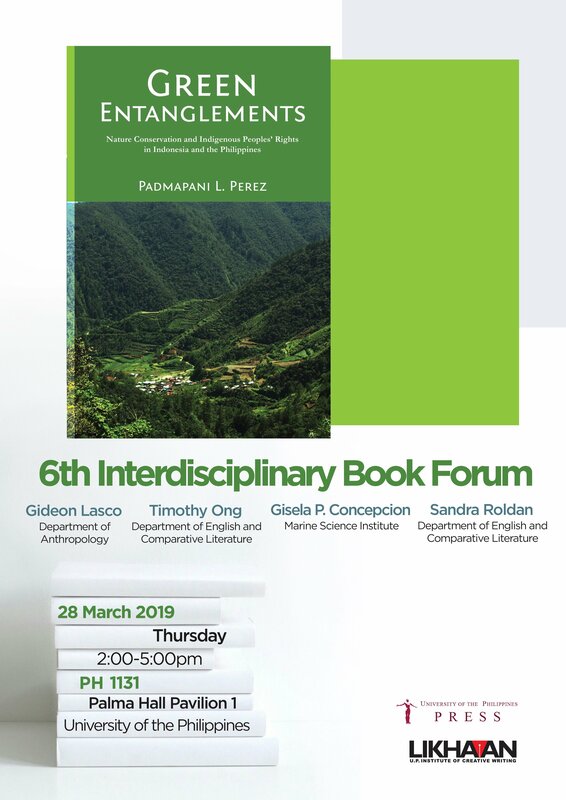 Green Entanglements: Nature Conservation and Indigenous Peoples’ Rights in Indonesia and the Philippines by Dr. Padmapani L. Perez is the book-in-focus of the sixth installment of the Interdisciplinary Book Forum (IBF) to be held on 28 March 2019, from 2:00 to 5:00 pm, at Room 1131 of Palma Hall Pavilion 1, UP Diliman. The panel of discussants for the sixth IBF is composed of Dr. Gisela P. Concepcion (Marine Science Institute, UP Diliman), Dr. Gideon Lasco (Dept. of Anthropology, UP Diliman), Asst. Prof. Timothy F. Ong (Dept. of English and Comparative Literature, UP Diliman), and Asst. Prof. Sandra Roldan (Dept. of English and Comparative Literature, UP Diliman). They will share their thoughts about the book, particularly as it relates to the nature and context of their respective disciplines. Since 2016, the UP Press and LIKHAAN: UP Institute of Creative Writing have been hosting the IBF every semester to gather leading minds from various disciplines to discuss social, political and other issues generated by a book recently published by the UP Press. The IBF is part of the outputs of the interdisciplinary program Literacy, Literature, and Translation for People Empowerment that is supported by the Office of the Vice President for Academic Affairs through the Emerging Interdisciplinary Research Program. Admission to the IBF is free.